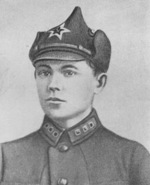 ww2dbaseNikolai Fyodorovich Vatutin was born in Chepujino, near Kursk, Russia into a poor peasant family. He attended the Infantry School of Poltava and was commissioned in the Russian Army in 1920. He fought against the Ukrainian peasant partisans of Nestor Makhno in 1920, and in the following year joined the communist party. Between 1926 and 1936, he attended the Frunze Military Academy and the General Staff Academy in-between several service assignments. In 1937, when Joseph Stalin began purging the Russian military of potential political enemies, Vatutin used it as an opportunity to advance, becoming the Chief of Staff of a Kiev Military District. In 1939, he planned for the Russo-German joint attack on Poland and served as the Russian Southern Group during the invasion. In 1940, while serving under Georgi Zhukov, his unit seized Bessarabia from Romania. Later that year, he was promoted to the rank of lieutenant general by Stalin and given the position of Chief of the Operational Directorate of the General Staff. He was at this post when Germany invaded the Soviet Union. ww2dbaseOn 30 Jun 1941, Vatutin was appointed Chief of Staff of the Northwestern Front; though he lacked experience, his audacity led to several rare Soviet offensives at this stage of the war, including one near Novgorod, Russia against German General Erich von Manstein's forward armor units, forcing Manstein to pause the attack and regroup, thus losing momentum. His poor military planning abilities, however, led to a very high casualty rate among his troops. In Jan 1942, he managed to trap two German corps at Demyansk, Russia, achieving the first Russian encirclement of German forces, but was unable to defeat the dug-in German troops until Apr 1942, mainly due to the lack of available Russian aircraft to knock out German defensive positions. 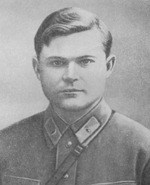 Between May and Jul 1942, he served as the deputy to the Chief of the General Staff of the Red Army. On 1 Jul 1942, he was sent by Stalin to the Bryansk Front; upon his arrive, he took over the troops, renaming it the Voronezh Front. He was unable to hold the city of Voronezh, but his troops halted further advance of German troops in the region, which ultimately led to the German decision to shift pressure at Stalingrad in Southern Russia instead. On 22 Oct, Vatutin took command of the newly formed Southwestern Front and launched several offensives against the German troops at Stalingrad. In Dec 1942, his troops encircled and destroyed about 60% of the 130,000-men Italian VII Army, which was marching to reinforce the German forces at Stalingrad. In Jan 1943, he repeatedly advanced against German troops in Eastern Ukraine, allowing General Filipp Golikov to capture Kharkov, but he did not recognize that he was over-stretching his lines, and Manstein seized the opportunity to re-capture Kharkov; Stavka placed the blame on Golikov, while promoting Vatutin to the rank of army general. On 28 Mar 1943, he took over Voronezh Front once again. During the Battle of Kursk, he deployed his troops effectively and surprised Manstein at several occasions with his ability to switch from defense to offense, thus contributing much to the eventual Russian victory at that battle. On 6 Nov 1943, his troops captured Kiev, Ukraine. Once again he over-extended himself and was the subject to several of Manstein's well-executed counter-attacks, but Manstein's forces were now getting weaker, and could not sustain the type of continuous offensive needed to turn back the Russian advance. ww2dbaseVatutin's two brothers, Afanasy Fyodorovich and Semyon Fyodorovich, were killed in action in Feb and Mar 1944. Their mother, Vera Yefimovna, buried three sons within two months. 16 Dec 1901 Nikolai Vatutin was born. 24 Dec 1943 General Nikolai Vatutin launched another winter offensive, starting with the capture of Berdychiv, Ukraine. 15 Apr 1944 Marshal Nikolai F. Vatutin died in hospital from wounds suffered when his car was ambushed by Ukrainian guerrillas on 28 Feb 1944. Are we sure he was ambushed? Respecting Saturn Operation, 8th, not 7th Italian Army! Otherwise, this is a weak entry. PLAESE do new research and re-write! Bruce M. Wl Albert, Ph.D., PDRA, Durham U.